An interesting trick-taking game with a bit of a twist - the trump suit is every other colour apart from the one first played/led! I am reviewing the 1995 edition, which is apparently identical to all other versions apart from card design and number of players. Versions: The NSV German 5th edition (the more common version) only plays 3 to 6. This is the 2012 NSV edition - it has different cards and only plays up to 6. 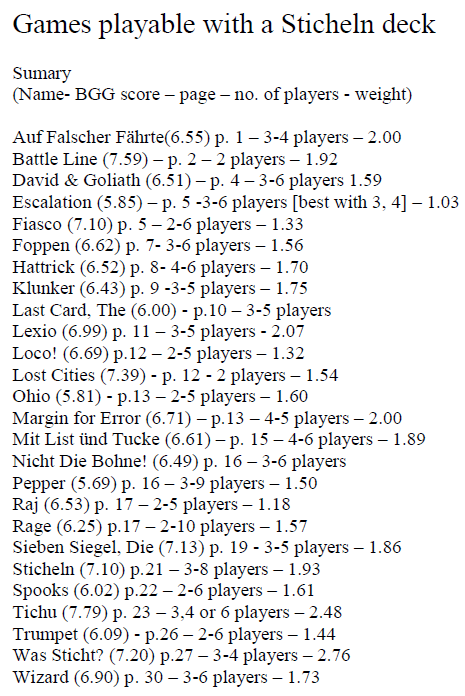 Players: The NSV 5th edition, shown directly above, only plays 3 to 6. The 1995 Amigo Edition plays 3 to 8. Price Range (AUD): $17.95 to $32 (but at the time of writing there is a website offering a sale of the game for $15). Availability: Whilst I wouldn't say the 5th edition of this game is rare, it doesn't seem to be a readily available game. I have checked online and it doesn't seem to be widespread. I purchased my 1995 edition not from a store but from a person who still had a new copy of the game for $25. I was willing to pay the extra amount to have the luxury of playing 8 people with the 1995 edition. The 1993 edition I am reviewing has been out of print for some long time now. 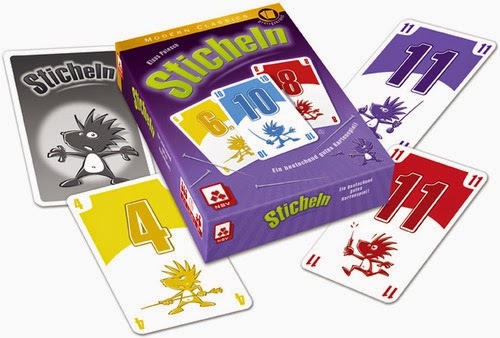 Trivia: You can use a Sticheln pack to play many different types of games as the deck is literally just a deck of numbered cards in different colours! This is game has a lot of strategy to it, and its idea is certainly intriguing, but like many games of its type, it has this problem where mere mortals such as myself struggle to find the optimum path to victory. This is not really a criticism of the game mechanics itself - more a comment that it won't appeal to every type of gamer out there, particularly those not liking difficult games. It's one of those games that I would "love to love more" but I find myself struggling to do so because its gameplay and strategy isn't entirely straightforward (because there is a difficult learning curve of sorts). Furthermore, I feel that only people who really like trick-taking games would enjoy this game. Nonetheless, I do quite like this game, and it can be a very good game when played with the right people. Sticheln's concept is unique in that players try to avoid a chosen "misery colour/suit" whilst trying to force other players to take tricks in their own misery colour (kind of like the classic game Hearts in that sense where one must avoid taking Hearts and the Queen of Spades, but try to give it to others). This is quite an interesting opening choice - you should choose a suit where you have enough low cards to "duck" attacks from your opponents; but at the same time you should also not pick a suit where you have too many cards such that you'll be forced to trump other tricks (thus winning them and collecting more cards of your misery colour into your hand - see rules for a better idea). However, the true ingenuity behind this game is is its definition of a trump card: any other colour besides the one first played is the trump card. This can create all sorts of strategic dilemmas, and those cunning enough to not only remember what has been played, but anticipate what will be played (especially in the context of deciding when to play the cards of your misery colour), will be able to do well in this game. As I said earlier, I do quite enjoy this game. Its only main drawback is the fact that - if this is can even be considered a proper "drawback" - I feel that many players, especially myself, don't really know how to play this game properly and strategically! The learning curve is steep and it will take some trial and error for the ordinary person to get the hang of the strategy behind the game. The game is a bit chaotic because you can never guess what people will do, especially if you lead or your turn order is somewhere in the middle. I also should say that I don't quite enjoy games that require a certain amount of "set-up" time - and this is one of those games, as the number of cards, numbers...and colours or suits (!) you play with depends on the number of people you are playing with. Overall this is a different, interesting game that satisfies a niche in gaming: trick-taking. Interesting mechanic of "all other colours" being trump cards. Strategic depth as you try to pin certain colours on different players, whilst avoiding your own misery colour. Can be used to play other games - deck is intuitive. Relatively difficult game in many senses - while it seems like there is a lot of strategy involved, it is quite hard to know what card to play and when one should play it as you never know what your opponents will do. In this sense, the game is subtly complex. Try this if you love trick-taking games like Bridge, Hearts or Tichu - you will find it contains a novel concept. The components are just a pack of cards as shown above - cards in Brown, Yellow, Violet, Green and Blue (with numerical values ranging from 0-18 or 0-20, depending on the colour). At the start of the game, everyone puts a card face up in front of them. This represents their misery colour which is the colour they DO NOT want to take tricks in. The numerical value of a card in your misery colour, including your first misery card placed down, is = to the number of points you lose. So in the above example, it is the start of the game: Left puts Green as their misery colour. Top Right puts Yellow; Bottom puts Brown. Left is immediately on negative 1 point. Top right is immediately on negative 2 points. Bottom is on zero points. Rule #1: If everyone plays the same colour, the highest colour wins. In this three player game, Left leads and wins with the Red 8 as everyone else put lower cards than him. Rule #2: All other colours besides the card led is a trump card. The highest trump card wins. Here, Left leads with the Red 8, Top/North plays a Red 6. Bottom Right plays a Yellow 1. Bottom Right wins the trick as Yellow is a different colour to the colour first led (Red). Left leads with the Red 8. Top Right plays the Blue 2. As it stands, Top Right is winning. Rule #2b: The person who lasts plays the highest trump wins. Therefore, Bottom Right, in this above example, wins again as Bottom Right's 2 came after the first Blue 2 was played. Here, even though Bottom Right plays last with a different colour, Left wins the trick with the Red 8 as Zero is never a trump. As you can see, there is quite a lot of strategy involved here - for example, sometimes it is in your incentive to lead with a high card (especially if it's in your misery colour) if you know that your opponents only have cards in your non-misery colours. Hence counting cards, choosing the right misery colour and observing what your opponents play are all equally important.